South Africa, as a country, has been incredibly slow to take up the challenge of sustainable living. Yet we really do need to embrace this challenge and build using sustainable materials and sustainable methods, so that we have sustainable homes. We also need to live a lifestyle that honors the ethics of conservation. It’s not about “bunny hugging”, or as I heard one Cape Town-based radio host say the other day – “a kind of religion”. We simply can’t afford to ignore the need to save energy and conserve resources. 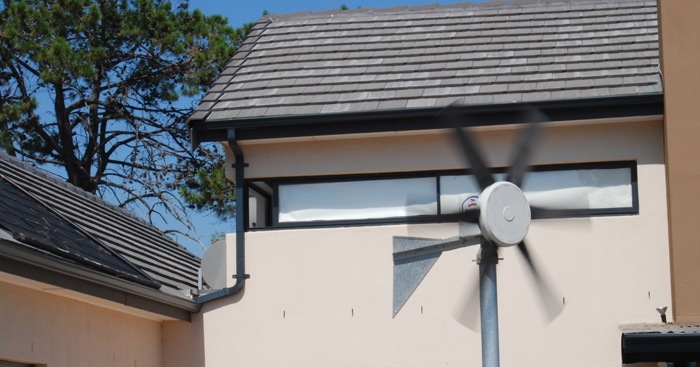 A micro-wind turbine can be used to generate at least some of the electricity that you need in your home. Our natural resources and the world’s fossil fuels are on the decline. Water is becoming increasingly scarce. Electricity continues to increase in cost to the extent that it is becoming unaffordable even to the middle classes – never mind the masses. Pollution affects our water, the air that we breathe, and the earth itself. Waste continues to accumulate, in spite of huge efforts by local councils and individuals to recycle and reuse. At the end of the day, we are accountable, and need to help educate those who shrug off this accountability. You can separate your rubbish into waste for compost, recycling and stuff that really is “trash”. Use your vegetable waste to make compost for your garden – with or without worms. Grow your own veggies and herbs, or at least some of them, and don’t use pesticides. Use your homemade compost and only organic fertilizers. You can buy products that are organic – from toiletries to building materials. When you build or renovate, change to solar power. You’ll be amazed at the money you can save with even the least expensive hot water cylinders and solar panels. Turn off lights; turn down your hot water cylinder (if you’ve got a solar panel, in summer you can have it set to 20-something degrees and the water will still be piping hot). Don’t leave the tap running – ever. If you bath, channel this so-called grey water out into the garden. Channel rainwater into a tank and use it in the house or garden. Switch to compact fluorescent bulbs and ensure you dispose of the incandescent type correctly (for example in containers provided by those who are committed to recycling). Insulate your roof and your pipework – if they aren’t already – and always close the door in a room that is heated. Avoid products with toxic ingredients. Consider every possible option for alternative sources of energy, for instance a micro-wind turbine. Over the past few years I have written countless articles for US and Canadian clients about sustainable building methods. As a result I am convinced that there is nothing that people in other countries are doing that we can’t do here. Our only disadvantage is that generally, the sustainable approach is still more expensive than the one we have traditionally learnt to accept. But slowly this is changing, and the faster people embrace these methods and use sustainable materials for building, the easier – and cheaper – it’s going to become. The good news is that government and its agencies are demanding more environmental accountability. The introduction of SANS 10400-XA: The Application of the National Building Regulations – Part X Environmental Sustainability – Part XA Energy Usage in Buildings, is perhaps the most positive step since it will force us to take action in the construction industry. It will also force owner builders to adhere to minimum guidelines that relate to environmental sustainability and energy usage. Are you ready to go green? I am. Please assist with my query below. We are looking to install a generator on our property, Do building lines apply to generators? Generators are not covered by the national building regulations. There may be bylaws that specify positioning. If the generator is to be covered by some sort of structure then the NBR would be relevant. From what I understand from all the solar water information that I have seen is that it is not cheap to install but that one has to do the calculation over the long term and that is where the savings will be. That is why the government brought in the new SANS 10400XA regulations. 4.5.2.1 A minimum of 50 % by volume of the annual average hot water heating requirement shall be provided by means other than electrical resistance heating, including, but not limited to, solar heating, heat pumps, heat recovery from other systems or processes. 4.5.2.2 The solar water heating systems shall comply with SANS 1307 and SANS 10106, based on the thermal performance determined in accordance with the provisions of SANS 6211-1 and SANS 6211-2. The installation thereof shall comply with SANS 10254. So you will see that solar heating is one of several options and not all heating needs to be alternative. But energy saving must be complied with. What is the question Esquire? Apart from anything else you need to have a good working knowledge of these systems to go into business installing them! It really isn’t a get-rich-quick option!